In the previous blog post, I gushed about the latest technology and the benefits of each piece to your practice. Technology now has the capacity to help reduce monotonous tasks, provide you with marketing tools, and help reduce your paper consumption. But I also did mention that technology should be treated like part of the team as opposed to the entire team. 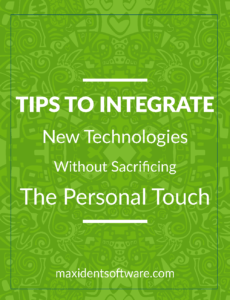 And this, along with other tips, will be explored throughout this post as it applies to the integration of new technologies, because it is important to acknowledge that sometimes technology can be a hinderance rather than a help if not utilized with the right intention in mind. With the assistance of professional resources, I hope to help you navigate the raging waters of integrating new technology while also keeping you aware of the issues and how to best avoid them. First, it’s important to know what you’re looking for and how it will benefit your practice. New technologies are always being designed to target specific needs. So you have to ask yourself–“What does my practice need in terms of new technology to enhance the success of my practice?” By identifying what is and is not needed, you stand a higher chance of avoiding financial distress. Allen Schiff, a CPA and CFE suggested in his article “to include your dental team in the brainstorming session, wherein you identify new technology and discuss the pros and cons of implementation.” Getting your team involved with these kinds of decisions gives you a more rounded perspective of what type of technology is needed in the office and what would hinder yours and your staff’s performance. What about the pace of integrating new technologies? Research suggests that the best pace is the one that is comfortable for you and your team. Sometimes you become hindered by technology due to an inefficient amount of experience and/or training. In an earlier blog post (read it here), I discuss the importance of proper software training. The same applies with integrating new technologies. No matter what they are or what they can do, inefficient training and experience can turn that technology into a liability. This is why it is so important to integrate at a pace that is comfortable yet still challenging and why providing the proper amount of training is crucial to the continued success of your practice. According to an article published by oralhealthgroup.com, “Tomorrow’s appropriate technology adoption will be less about gadgets and ‘wow factor’ and more about security, communication, and patient retention.” We will discuss the aspects of communication and patient retention as they relate to integration, but just as in this quote, security comes first. Because your patients expect it, the security of their personal, financial, and medical information is vital to patient retention, which is why this must be repeated and must be taken seriously. Severe security risks continue to circle businesses like hungry sharks, just waiting for the chance to attack and take down the entire system. Always, your best defence is awareness and vigilance, but we have also provided you with several preventative measures mentioned here, here, and here for your added knowledge and security. However, sometimes bad things happen. Whether it’s a hacker or a blizzard, sometimes the loss of your data can’t be avoided. In those situations, the best preparation is to have a sufficient backup and recovery system. Maxident provides MaxiVault for just these kinds of circumstances, and more, providing automatic backups on the cloud and getting you up and running smoothly and quickly after an unexpected disaster. “The world is changing very fast, therefore you either keep up or will need to catch up.” A quote that comes from centricconsulting.com and could not be more true. Technology does not update over years but rather months. That’s why it is always important to look out for new technologies that open up new business opportunities and provide a more effective way to handle certain monotonous and time consuming tasks in your office. To stay current means to stay ahead of the game. Understand how to use and handle the technologies you have and stay up to date with any new updates or upgrades through the software website, the latest news or even emails you receive. The integration of new technologies is vital to keep the heart of your practice beating, but keep in mind that in order for these new technologies to be used to their full potential, you must choose carefully and integrate at a comfortable pace in order to make sure everyone working with those technologies are efficiently trained. But with new technology comes the urge to let it do all the work for you, especially when it comes to patient communications. At this point, in an era of apps and email and IM messaging, it is extremely important to remember that even the best and most updated technology cannot replace good old fashioned face-to-face communication. And even though your patients will most certainly appreciate the many ways they are able to contact you now, it is the live and in-person experience that will always keep them coming back to your practice.